Friday night, less than 24 hours before the prejudging of the Pro Bodybuilding Weekly Championships, we sat down with two competitors - Toney Freeman and James "Flex" Lewis - with perhaps the most to prove in Tampa. Freeman, who a year ago was being mentioned as a top-three Olympia threat, has to prove that he is still capable of coming in in the condition he achieved in early 2007, when he stormed to a win at the Ironman Pro and a third-place finish at the Arnold Classic. Lewis, a 24-year-old rookie, will be taking the stage for the first time as a pro in both the 202 Pound Class and the open show. FLEX: DO YOU FEEL LIKE YOU HAVE SOMETHING TO PROVE AT THIS CONTEST? Toney Freeman: I have something to prove to me. I know I'm supposed to win shows, especially the smaller shows. So when i compete,if I get second I still feel the same as if I got 10th. So unless I come up number one, I came up short, I didn't do something right. There hasn't been too many show s that I've competed in where somebody was just a straight up better bodybuilder than me. They were better than me on that day,but on any given day it can go either way. As long as I come close to that I'll keep competing. I' having fun. Freeman: Right, 20 days away! FLEX: WE HAVE SEEN GUYS HITTING THE WALL AT AROUND 40. IN YOUR MIND ARE YOU - AND IF SO, WHY ARE YOU - STILL ABLE TO IMPROVE? Freeman: I took a five year break. I didn't train, I didn't take a supplement. I was a non-bodybuilder for like three-and-a-half of those five years. That had a lot do do with it. Im super-duper health conscious, almost like a hypochondriac. I do things that most people, when they hear what I do, they just laugh. You can call it high-tech, you can call it weird, you can call it whatever. But you only get one of these (points to body). I've learned that it doesn't really matter if you look like a million bucks on the outside if you're corroding and rotting on the inside. I make sure that I cleanse every month, I make sure that I eat organic when I'm dieting for shows ... but the reason why I'm still able to do what I'm still able to do is because of my mentality. I know that just like NASCAR, just like any other sport ... we're machines basically. You see which cars break down, they got to get new engines, new tires. We can't really do that, but we can do something like that. And that's what I do. FLEX: GIVE ME THREE REASONS WHY YOU WILL BETTER HERE THAN YOU WERE IN EARLY 2007. 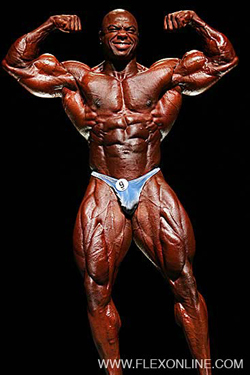 Dexter Jackson is the most conditioned guy in the sport, so I'm shooting for Dexter condition-wise. 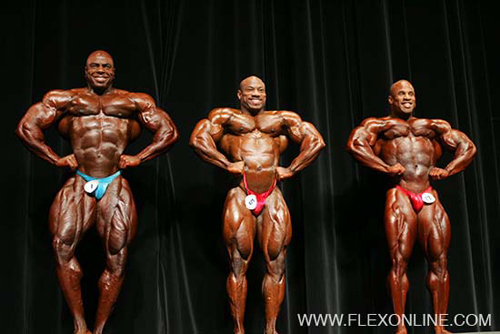 Muscularity, I think Kai Greene is probably the man right now, him and Phil Heath. So if i can match my muscularity to Kai ...and then Victor also, he's the back guy. I'm just making sure that I can hang with all those guys and their strong points, and then I'll dominate in my strong points. FLEX: THE GUYS YOU JUST NAMED ARE THE BEST IN THE WORLD. YOU DIDN'T MENTION ANYONE COMPETING IN THIS SHOW TOMORROW. IN YOUR MIND IS THERE ANYONE IN THIS SHOW THAT CAN TOUCH YOU IF YOU COME IN THE WAY YOU SHOULD? Freeman: No. Honestly, there's no one in the whole game that I'm worried about if I nail it. If I nail it and you beat me, then you're better than me and I have to give it up, because I'm a fan of the sport. But if I nail it, and everyone else nails it, they're gonna be scratching their heads. If you take the top 10 guys in the word, I know I'm in the top 10, period. FLEX: BACK TO THIS CONTEST. WHEN THE FINAL RESULTS ARE IN, WHO IS IN THE TOP THREE TOMORROW NIGHT? Freeman: I think it's gonna be me, Dennis [James] .. and I'm not sure about that third person. I have my favorites. I'd like to see Darrem [Charles] up in there... maybe Dave Henry in there. Who else is in there? Mark Dugdale. My opinon, because I know Joe (McNeal) and I know how Mark looks without Joe ... if anyone's in the back of my mind, it's him. I know he already comes in peeled. So if he can add five, six, seven ..
Freeman: 10? See what I'm saying? See that's a whole other person. So 10 pounds heavier then when I beat him at the Ironman? Then I don't even know about that dude. That dude is going to be something to deal with. I expect big things for Mark. 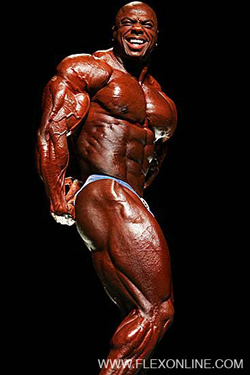 FINAL QUESTION - THE OLYMPIA, THE FINAL POSEDOWN. WHO IS IN IT? Freeman: Jay, Dexter, Dennis [Wolf], Myself, Phil ... and I'm gonna have to go with Silvio. Cause they always do (laughs). I love Silvio too, so I'm thinking that, you know, he still looks like he's ready to walk on stage right now today. Oh - or Melvin. Can't forget about Melvin. GO TO PAGE TWO FOR FIVE QUESTIONS WITH FLEX LEWIS! Flex Lewis: So what are these five questions? FLEX: HA. FIRST ONE IS EASY. YOU WANT TO HOLD THE RECORDER? Lewis: Yeah. Because you won't be able to understand my accent from that distance. FLEX: OK. A YEAR AGO YOU WERE GETTING READY FOR THE BRITISH NATIONALS, WHICH CAME WITH IT'S OWN TYPE OF PRESSURE. HOW DOES THE PRESSURE YOU ARE FEELING NOW COMPARE TO LAST YEAR? Lewis: The pressure last year was a lot more. I allowed myself to put pressure on myself. There were a lot of things externally going on, outside of the sport as well as inside. At one point in time I didn't know if I was going to do the show. I don't mind mentioning you as one of the people who took me aside and said Flex, you can do this.. So thanks to good friends and family that came around at the right time, I got my mind back into thinking positive. For whatever reason, six weeks out of the British Championships I started letting the pressure get to me. This year, me and my fiancee Shina Mitchell have moved to Brentwood, Tennessee. That's a great area, it's heavily involved in fitness but I don't get any of the distractions I was getting when I was living elsewhere. This year I haven't allowed myself to build up that pressure. I'm settled down, I've got my own house. So I'm going into this show more driven and motivated. If anything I had to put the breaks on going into the show because I was going in too fast. I'm excited because this is something I've been waiting to do since I was 15 years old, step on stage as an IFBB pro. When I start thinking about the names that will be on stage ... I get butterflies. But the pressure - no. FLEX: SO LET"S PICK UP WITH SOME OF THE NAMES. WHO ARE SOME OF THE NAMES TAHT ARE GIVING YOU BUTTERFLIES? Lewis: You know, the top 10 Olympians from the past. Dennis James, Darrem Charles, Toney Freeman. Even in my class you've got David Henry who is a top 10 Olympian. When I start thinking about that I get nervous, but I get excited as well. Knowing that here I was was, watching Dennis James four years ago in the British Grand Prix, and now I'm going to be standing next to him. So it's exciting. FLEX: GIVE ME THREE REASONS WHY FLEX LEWIS IS GOING TO BE BETTER TOMORROW THAN HE WAS A YEAR AGO. Lewis: Because I've changed my strategy going into shows. My offseason, this was one of the best I've had. Just went to the gym and did my thing. Just lived the lifestyle. My strategy, I changed my diet around which worked for me. More so down to th fact that I've got stability and friends around me that are true friends. FLEX: GIVE ME A PREDICTION. WHERE DO YOU FINISH TOMORROW? Lewis: I've always trained for first place in every show that I've done and would never go into a show thinking I would place less than first. But obviously I'm being realistic in the open class. But in the 202 Class, I've trained to win that. Of course what happens on the day happens on the day and I know there is going to be some great athletes in the 202. So the 202 is my main targeted show. FLEX: GIVE ME THREE REASONS WHY YOU WIN THE 202 CLASS. Lewis: Why I'm gonna win the 202? That's a bit direct isn't it? FLEX: THAT'S TWO. I NEED ONE MORE. Lewis: (Laughs) Ok! Basically the third would be that I've targeted certain areas of my body that I've seen other competitors are lacking, such as glutes and hamstrings. I've really sort of hit them hard. I notice a lot of competiors don't come in condition. For me there's no excuse. With this 202 class, a lot of guys who would easliy make this 202 class but compete in the open, there's no excuse for lacking in condition. So I think conditioning is going to be my key. FLEX: OK, BONUS QUESTION: WILL YOU BE THE BEST CONDITIONED GUY IN THE SHOW TOMORROW? Lewis: Well, we'll see tomorrow morning (Laughs). You're a bugger. I hope so. GO HERE FOR AN IN-DEPTH INTERVIEW WITH FLEX LEWIS ON BODYBUILDING.COM!